Inglot Freedom System Lipstick Refill in shade 14 is the perfect everyday pink for me! Before I start with my thoughts let me apologize for the crappy pictures! My camera has a mind of its own and this time it didn't want to take good pictures plus I forgot the very basic rule of photography ie never to take pictures under tubelights! I always take pics during day time but yesterday was really busy for me...anyways I have tried to make the pics look as true to the actual colors as possible..hope you don't mind! So if you have known me long enough you would know I love Inglot as a brand for their high quality eyeshadow and lipstick refills! Infact there was a time when I was obsessed and I mean totally obsessed with them and would browse for hours to see the swatches online! During my obsession phase I bought quite a number of lipstick refills and Shade no 14 is one of them. Inglot freedom system refills come in variety of colors and I am sure everyone will find their HG shade in them. I love the formula of these, they are creamy and glide smoothly on lips. The pigmentation is fantastic! Though if you have extremely pigmented lips it might take couple of swipes to cover them but it will cover! My absolute favorite is the finish! I adore matte lipsticks which are light weight and have good staying power. I am a working women so I love something which will give me a nice polished look and stay for long time since I am not too fond of reapplying makeup in office nor do I have that much time! This lipstick sets to a semi matte finish without feeling dry on my lips which is a huge plus. I hate lipsticks which dry out my already dry lips and turn them into flake monster! If you have dry lips I would suggest you to apply a lip balm first, though it does not settle into fine lines but its better to exfoliate lips before applying a matte lipstick. This will also increase the staying power and give overall a polished look! The shade no 14 is gorgeous pink with purple undertones! 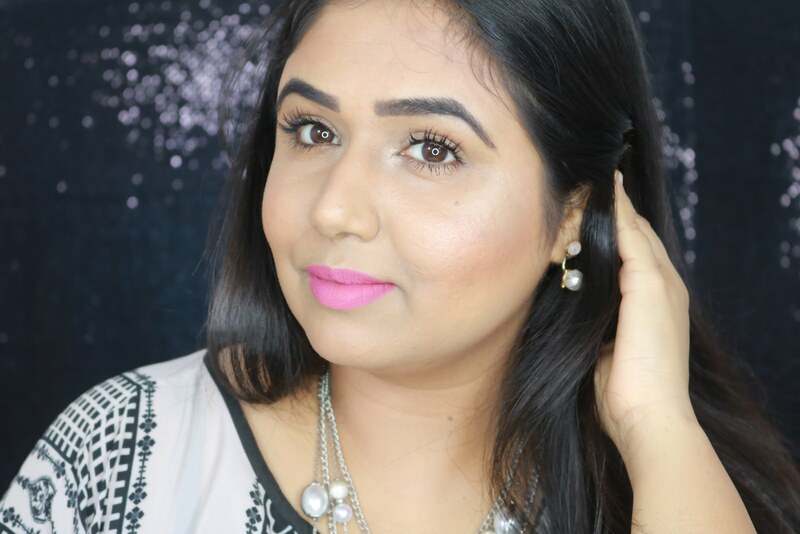 I feel its one of the best pink lipsticks in my collection and I am completely obsessed with it right now! Its subtle enough to wear during the daytime or to office. It will suit all skin tones, I am between NC40 - 42 in MAC and you can see I can carry it off well..atleast I think so :) what do you think? It does not bleed or settle into fine lines and stays on me for about 6 to 7 hours with full meal in between. Even after 6 hours it leaves mild stain behind which looks good. The only con will be that you need a lip brush to apply it but in my personal opinion its totally worth it! This is how it looks on me :-) Please excuse my bare face and horrible dark circles, it was evening and I didnt feel like putting on foundation and concealer. Ur lukin soooo pretty pari..a lovely shade yet again...ur d Inglot queen!! such a pretty pink yaa!!! very similar to the Nicki minaj lippie! Wanted to ask u something Parita, i saw some of the freedom lipstick and eyeshadow shades on some of the indian blogs but when I checked the shades in my local store they were not the same. Do you have different numbers over there? Hey Rachna..no as per my knowledge the numbering is same across the world..may be the swatches you saw online were taken in different lighting and hence the shades looked different?